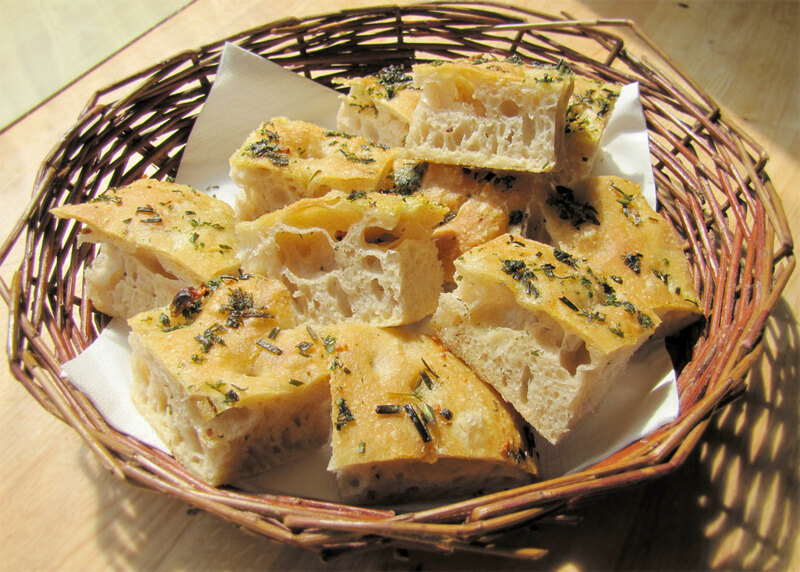 Recipe with video - Foccacia is an italian flatbread that is in family with the pizza. 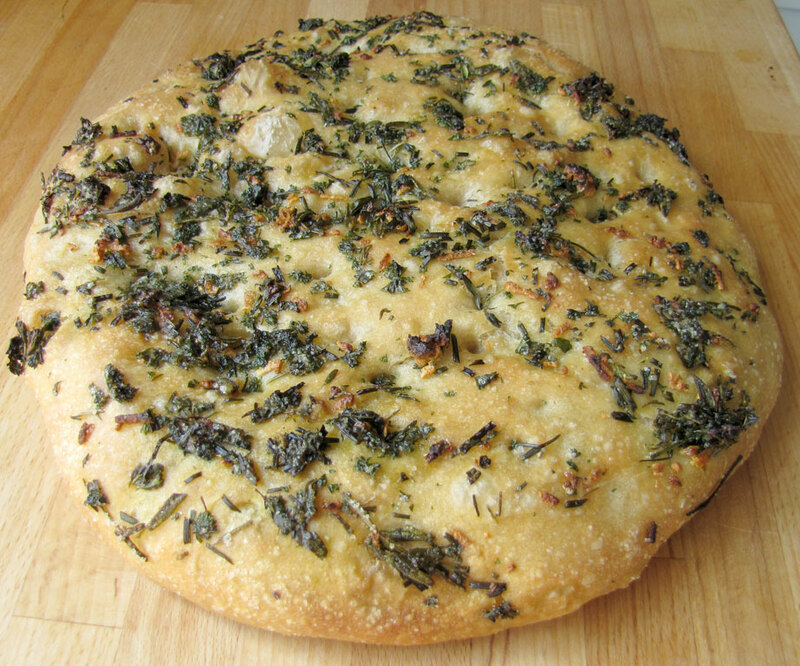 But unlike the pizza foccacia is served as a sidedish. I sometime serve it at family gatherings, where it dissapers like dew in the morning sun. And I am constantly asked for the recipe. So here it is. Pour the oil, the roughly chopped garlic, the spices and herbs into a small pot. Heat it to around 50 degrees C (122 F). Approximately the same temperature as hot running water. It should not be too hot. Only hot enough to extract the aromas from the herbs. Leave it to soak until you need it. But at least ½ an hour. That makes the taste and aroma from the spices flow over into the oil. That way the herb flavour will also get into the bread together with the oil. That will not happen if you just put the oil on top if the bread and then sprinkle on the herbs. It is basically a "no knead" recipe. Mix all the ingredients and let it rise for 10-12 hours. Pour it onto a flour covered table. Fold it three or four times and shape it like a ball. Put the ball onto a baking pan that is covered in baking paper. You really should use a deep baking pan to avoid the oil spilling into the bottom of your oven when you bake it. Cover your hands in oil, and pat down the dough until the top is covered all over. That prevent the dought from drying out while it rises, and the bread becomes more airy. Let it rise for 1½ hour. Put on the spice oil with a spoon. Including the herbs. Spread it out evenly. "Punch" down the dough with your fingers to make the bread flat. This will prevent the oil from running of the bread as it rises in the oven. A lot of holes to keep the good stuff on. Finally sprinkle on the salt. Let it rise for another ½ hour. I bake it on a pizza stone made of cast iron. It has an edge that prevents the oil from spilling into the bottom of the oven. When I have to use a regular "stone pizza stone" I put it into a deep baking pan. And then put that on top of the pizza stone to bake it. You can use any kind of oil. Olive or cold pressed virgin olive oil is good. Personally I prefer a 50/50 mixture of virgin olive oil and a regular mild vegetable oil. You decide yourself what herbs to use. I usually use 1 part rosemary and 2 parts of other herbs mixed together. I generally use some of these: parsley, thyme, oregano, chervil, sage, fresh coriander, basil, mint, chives. Just a little bit of everything. You can easily swap out some of the fresh herbs with their dried counterparts. The Italians make it purely as a flatbread, but I actually find that it is even better if you make a double portion of the dough, so you get a high and fluffy bread. You can also choose to make to bread out the dough. And then take the double amount of spice oil. That will make it more like a pizza, and that is good too. Sea salt is less dense than table salt, so a little less "salty" on the tongue. If I used sea salt would it still be salty enough to ferment the dough? My family loves this delicious recipe but the saltiness makes my tongue sore.